Zakynthos or Zante is an island of great natural beauty in the south-east of the Ionian Sea. It is an ideal holiday destination as it combines beautiful beaches, diverse natural landscapes, fun water activities and intense nightlife. It is often called the ‘Flower of the East’ (Il Fiore di Levante), a name given to Zakynthos by the Venetians that occupied it 200 years ago due to the flowers, trees and wild herbs that grow in the island. Zante is regularly connected with the west side of Peloponnese and more specifically with the port of Kyllini. More connections include Kefalonia and then Ithaca and Patras. Zakynthos is well connected to the mainland Greece with regular daily ferry routes from the port of Kyllini. Kyllini is located in the Peloponnese, easily accessible from Athens and the port of Patras by bus. The trip from Athens to Killini takes approximately 3,5 hours while the trip from Patras to Kyllini lasts approximately 1 hour. The actual ferry trip lasts around an hour. The connection between Kyllini and Zakynthos (Zante) is served by at least 6 itineraries per day during the whole year. During summer the number is increased to a maximum of 10 daily sailings. The duration of the trip is just 1 hour. Zakynthos can be a great start for an island-hopping trip in the Ionian islands. The small port of Agios Nikolaos, in the north of Zakynthos, serves frequent ferry routes to the port of Pessada in Kefalonia. The ferry trip from Zakynthos to Kefalonia lasts 1 hour. From Kefalonia you can take ferries to Ithaki, Corfu, Patra as well as Italy. Find out more about the ferry connections in the Ionian Sea on Ferryhopper.. The island of Zante or Zakynthos is a very popular holiday destination due to the variety of options and activities it offers. The capital of Zakynthos, is the commercial centre of the island that also concentrates the cultural activity with museums, churches and historical landmarks. A walk around the lively streets of the town of Zakynthos gives the local vibe while you shouldn’t miss the opportunity to see the view from the top of the old Venetian castle. Zakynthos is famous for the turquoise waters of its beaches as well as the caves and secret spots for the lovers of swimming and diving. 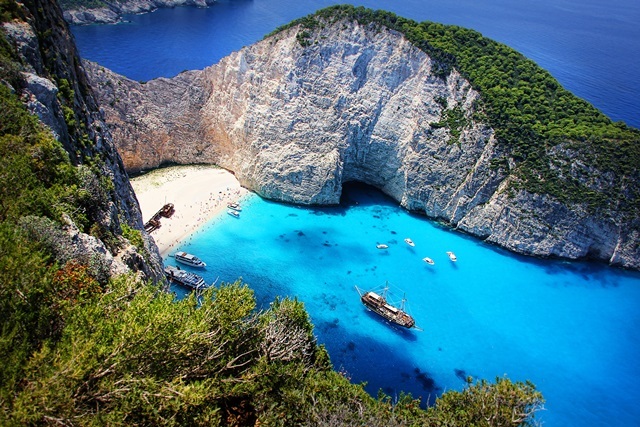 The iconic beach of Shipwreck (‘Navagio’ in Greek), is one of the most stunning sites of the island with the crystal blue water dominating and the wrecked ship lying in the middle of the beach making the view dreamlike. Many of the beaches in Zakynthos are organised (i.e. Gerakas, Banana, Laganas, or Argasi) and therefore ideal for families, kids and water activities. Many of the activities in Zakynthos centre around the island beaches, rocky cliffs, hidden caves, and mountain routes. One of the island highlights is the turtles and seals that appear along the beaches of the Laganas gulf particularly during the summer months. The big holiday resorts in the island also offer sport facilities, waterparks and fun parks for residents and visitors. While the natural beauty of the island is a strong attraction, Zakynthos is also considered to be a party island with the heart of the nightlife beating at the bars and clubs of Laganas, Alykes or Argasi. How to book your ferry tickets to Zante (Zakynthos)? Don’t think about it any further, the charming Zakynthos is waiting for you to explore it! On Ferryhopper you can find all the available ferry routes and book cheap ferry tickets to your favourite destinations!